CITY OF SAN FERNANDO, Pampanga — An exhibit showcasing stories of the country’s World War II heroes opened at the San Fernando Old Train in Barangay Sto. Niño, this city on Wednesday. This is in line with the City Government of San Fernando’s commemoration of the 77th anniversary of the Death March, paying tribute to the patriotism of Filipinos. Titled “War of Our Fathers”, the exhibit is a project of the city government and the Philippine Veterans Bank. It features several photographs, write-ups and artifacts captured and used by Filipino freedom fighters during the war. Renato Claravall, president and chief operating officer of the Philippine Veterans Bank, said the exhibit would convey to the younger generation the stories of the heroes during the war. “This Death March anniversary we are celebrating (is) an example of valor, strength, discipline, and commitment, which many people do not understand, especially the younger ones. That is why we are bringing up the stories of our fathers through an exhibit,” Claravall said. The exhibit will run until April 15. 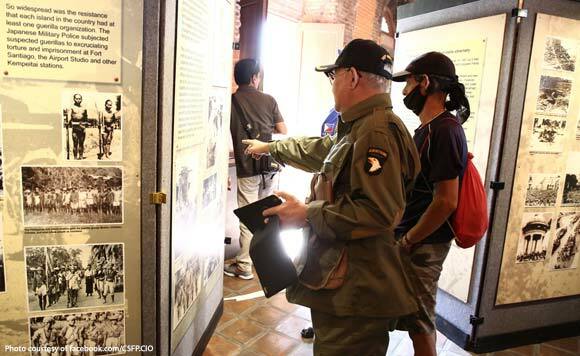 City tourism officer Ching Pangilinan, meanwhile, said the city serves as a tool to encourage every Fernandino to trace the contribution of Pampanga and San Fernando to the rich history of the war. “Pampanga remains to be one of the noble and heroic places, not just by sending soldiers (to) the World War II but also through Hukbalahap veterans who also contributed their own efforts. In the City of San Fernando, we do not forget its rich history and tradition. Every year, we give honor, not only to our forefathers but also to their families,” Pangilinan said. The city government also held a wreath-laying ceremony at the Death March Marker at the San Fernando Old Train Station, which also played a vital role during the Bataan Death March in 1942. It was the final stop of the Filipino and American soldiers in their 102-km. march from Mariveles, Bataan before heading to their final destination in Capas, Tarlac.